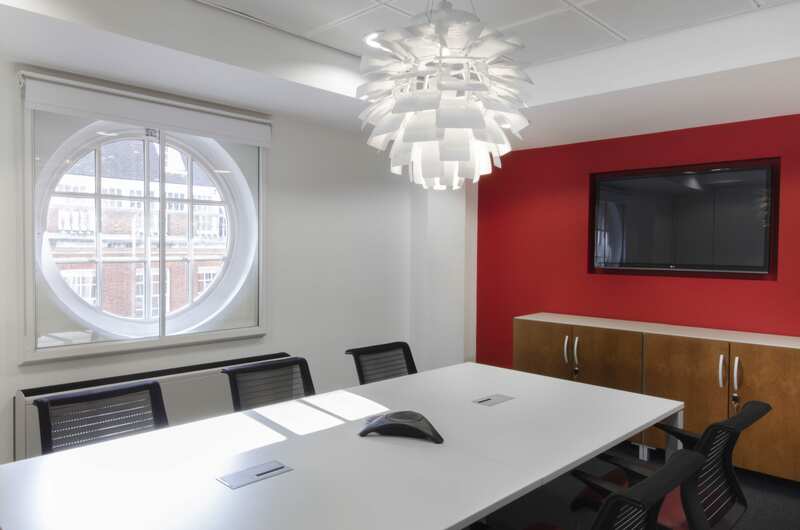 When Marine Capital decided to relocate to larger premises in Mayfair London, they wanted an office that reflected their values, was a pleasant place to work in to attract and retain the best talent, and reflected their business in a modern contemporary way without being stuffy or traditional. It was made clear that the “tanker model” cliche of the shipping company office, was not welcome in this office! Borrowing from certain themes relevant to the business, we set out in this Mayfair office design to create an inspiring work environment that was also at all times connected to the underlying values of the business. 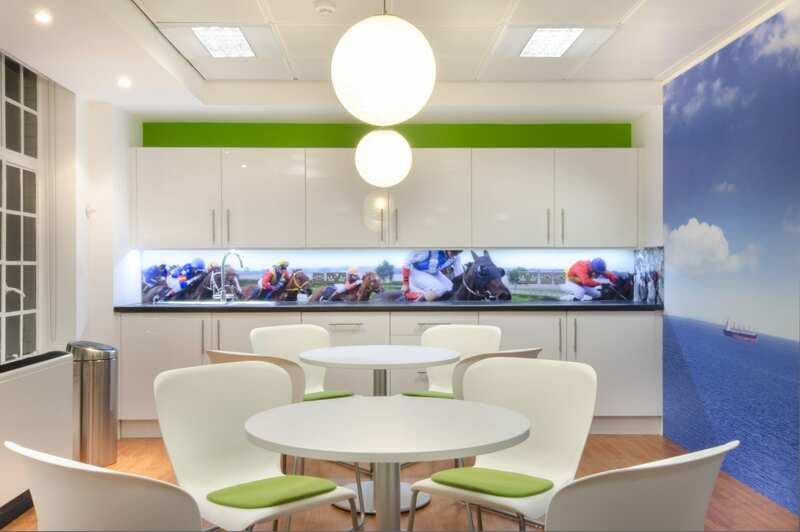 For example, the owner not only loved horse racing, but also all of their tankers were named after famous racing horses – so the glass splashback in the breakout area depicts a horse race rushing along the back wall. A fun and relaxing accent to the space. 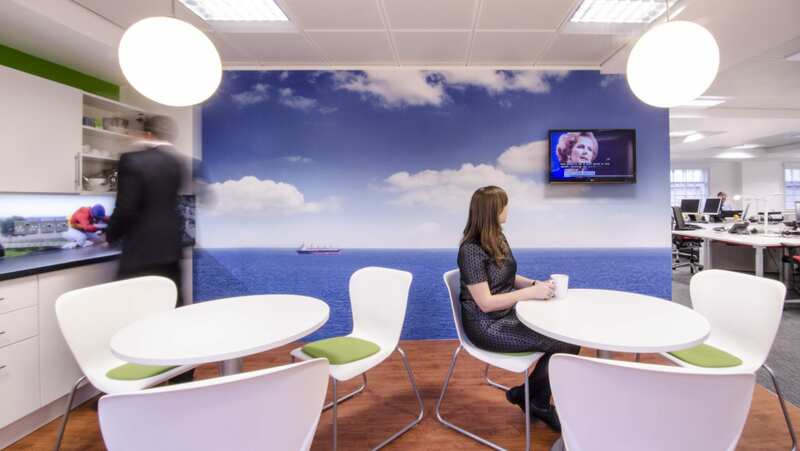 On the main wall of the breakout area, a full floor to ceiling image of an expansive seascape helps people to re-engerise and mentally step away from their work – but at the same time a small bulk carrying ship can be seen steaming towards the horizon keeping this little luxury relevant to the company vision. Even the two pendant lights are reminiscent of the two converging planets of the holding companies in their “Eclipse” logo. Keeping with the Eclipse theme, a red bordered curve across the entrance to the office hints at the Eclipse logo, and at the same time creates an attractive curved storage feature separating the entrance from the open plan area. Hints of red are picked up throughout the office without overpowering it. Even the frames under the desks are painted red whilst maintaining a dominant white for a clean, contemporary sharp look. The company invested in the best office chairs available for maximum comfort and chose 120 degree workstations to create a more interesting layout in open plan. They decided against desk screens, in order to keep the office as open as possible minimising barriers to verbal and visual communication. Store wall was used to divide space where full height was needed, to maximise efficient use of vertical division and minimise cost, with frameless glass used where sound privacy was required without closing off visual connection throughout the space. The entrance wall is a white corrian style “wavelet” design, hinting at the marine heritage, whilst oak floors bring a warmth to the space that works well with the white and hints of red. A feature pendant in the boardroom doubles as an eye catching centre piece, and all the technology is integrated into the table and walls to give a fully functioning wireless av solution that is also mirrored in the breakout areas. Apart from looking great, the office itself is completely functional to its purpose, with every detail considered in context for function and form. Overall the impression is extremely good, with visitors and employees impressed and delighted with the new space. Another inspiring London Office Design and Fit Out in the West End from our London Office.